When individuals consider great modern preachers, evangelists such as Billy Graham and pastors such as Chuck Swindoll, David Jeremiah, Greg Laurie, and the late Jerry Falwell may come to mind. However, if one were to consider who was among the greatest of preachers in the late nineteenth century, one would be amiss if Charles Haddon Spurgeon were not added to such a list. According to John Piper, Spurgeon preached “over six hundred times before he turned twenty years old. His sermons sold about 20,000 copies a week and were translated into twenty languages.” Spurgeon preached at the Metropolitan Tabernacle in London, England. John Pitts writes of Spurgeon that his “theology was moderately Calvinistic, his sermons warmly evangelistic, and his presentation of the gospel so fresh and refreshing that within a few months of entering upon his London ministry, at nineteen years of age, the crowds flocked to hear him and continued to do so for thirty-eight years.” Yet despite the great fame of the London preacher, in a bizarre twist, Spurgeon formally withdrew from the Baptist Union which was an association of Baptist churches of the time. The severance from the Baptist Union took a toll on Spurgeon. Pitts denoted that Spurgeon “died in 1892, his end probably hastened by the unhappy Downgrade Controversy in which he was involved.” Thus, one must inquire—what was the conflict that led Spurgeon to abandon the Baptist Union? This paper will argue that it was the intrusion of theological liberalism within the Baptist Union that influenced Charles Haddon Spurgeon to abandon his association with the Baptist Union in the so-called “Downgrade Controversy.” This paper will demonstrate the influence of theological liberalism upon the Baptist Union, at least as it was perceived by Spurgeon, in four ways. First, the paper will investigate the influence of theological liberalism upon the Baptist Union’s soteriology. Then, the paper will demonstrate the influence of theological liberalism upon the Baptist Union’s spirituality. In addition, the paper will examine the influence of theological liberalism upon Baptist Union’s morality. Finally, the paper will observe the influence of theological liberalism upon the level of authority given to the Word of God. The paper will begin this investigation by observing the influence of theological liberalism upon the Baptist Union’s soteriology. Soteriology is the study of salvation—emanating from the Greek terms soter meaning “savior” and logos defined as “study of” or “word.” Salvation is defined by Kenneth Keathley as “the work of God that delivers us from sin and its penalty, restores us to a right relationship with him, and imparts to us eternal life.” Soteriology is central to the message of Christianity. Therefore, it is a serious challenge when one’s soteriological understanding is compromised. Spurgeon had issues with the influence of Arminianism promoted through the lens of liberal theology which led to Socinianism, a form of Universalism. This theological excursus is merely to define Spurgeon’s involvement in this theological debate. Spurgeon’s issues were not as much with the Arminianism construct (although Spurgeon certainly disagreed with Arminians) as much as it was the extreme version of Arminianism which liberal theologians used to demerit God’s involvement in the salvific process. Liberal theologians began to introduce Socinian ideologies into the Baptist Union. Socinian beliefs held that Christ began to exist at the Virgin Birth and also held that God did not know every future contingent truth. Alan Cairns denotes that Socinus, from whom Socinianism is named, “denied that Christ offered any atonement or satisfaction to God for sinners, advocating the example theory of the atonement. He held that sinners are pardoned and accepted by God, through divine mercy, on the ground of their own repentance and reformation.” Such teachings were unacceptable to Spurgeon. Spurgeon denotes that “We too often measure God after a human standard, and hence make mistakes. Remember that God has such an abundance of mercy, and grace and power, that he never has to calculate how much will be necessary for the accomplishment of his purpose.” Spurgeon inquired, “Saved on different footings, and believing different doctrines, will they enjoy eternal concord, or will heaven itself be only a new arena for disputation between varieties of faith?” Spurgeon appreciated the differences between orthodox believers so long as such believers remained orthodox. Spurgeon denoted that “Although upon the doctrines of grace our views differ from those avowed by Arminian Methodists, we have usually found that on the great evangelical truths we are in full agreement, and we have been comforted by the belief that Wesleyans were solid upon the central doctrines.” Thus, Spurgeon was not out to create divisions due to minor theological variances, rather Spurgeon discredited any attempt to deprive the exclusivity of the Christian faith—something that some in the Baptist Union were attempting to assert. Spurgeon’s stand for the biblical understanding of soteriology is important and one that should be promoted among Christians in modern times. Theologians and sociologists alike have labeled the present period of thought as post-modernism. While this paper does not have space enough to describe the details of post-modernism, suffice it to say, post-modern thinkers are more susceptible to the acceptance of alternative soteriological constructs. Whereas it was important that Spurgeon took his stand for the biblical case for soteriology, it is just as, if not more, important that modern Christians do the same. This section has noted Spurgeon’s issues with the ultra-Arminianism did not stem from a particular problem with orthodox believers who adhered to a differing viewpoint. Spurgeon was not one who sought trouble where none existed. Rather, Spurgeon had issues with particular theories which evolved into systems which would be found beyond the umbrella of Christian orthodoxy, a system that elevated humanity over divinity which is a hallmark of liberalism. Spurgeon had another issue with the liberal theology growing in the Baptist Union—the lack of trust in biblical authority. Whereas Jesus is the foundation upon which Christianity rests, nonetheless the truths of Christianity—those truths presented about Jesus—are presented in the Bible. The Old Testament provides the foundation upon which the Messiah and the early church would emerge. The New Testament provides the foundational doctrines pertaining to the life, ministry, and teachings of Jesus and the early church. If a person begins to deny the authority and/or reliability of the Bible, then the foundation of one’s faith begin to crumble. Walter Elwell describes the importance of biblical authority as being so “vital to understand that this doctrine, far from playing a minor role on the fringes of Christian belief, brings us face to face with the authority of God himself. What is at stake in the authority of Holy Scripture is the authority of its divine author.” Thus, biblical authority is critical if one is to accept the core teachings of Christianity. Liberal theologians throughout the history of the church have a reputation for dismissing the authority of Scriptures. Spurgeon was one who remained steadfast upon the conviction that the Bible is inspired and infallible. Ferguson denotes of Spurgeon that at “the foundation of his approach to Scripture was his deep Christian faith and belief in the truth of the Biblical testimony. Faith in the redemptive acts of God as recorded in Scripture is the ground of Spurgeon’s hermeneutical system.” Therefore, it is not surprising that part of Spurgeon’s problem with the infiltration of liberal ideologies into the Baptist Union was the liberal theologians’ denial of the Bible’s authority in their convictions. Spurgeon denoted that “The case is mournful. Certain ministers are making infidels. Avowed atheists are not a tenth as dangerous as those preachers who scatter doubt and stab at faith…A gracious woman bemoaned in my presence that a precious promise in Isaiah which had comforted her had been declared by her minister to be uninspired.” One can appreciate Spurgeon’s sentiments. For a minister to discredit the Bible would be comparable to an electrician discrediting Ohm’s law. Such a one loses the foundation upon which they stand. Spurgeon thought that an acceptance of biblical authority was an example of the grace of God in one’s life. Spurgeon denoted that “A still surer evidence of grace is the mind’s perception of revealed truth and its obedience to it.” In contrast, if one were to deny the Scriptures, then where was the grace of God? With the apparent dismissal of biblical truth by some liberal adherents and the refusal of the Baptist Union to address the intrusion, one can understand why Spurgeon decided to withdraw from the Union. Modern Christians can learn much from Spurgeon’s stand. While Baptists hold a bad reputation for divisions, certain times present themselves where such a division is permissible. If the authority of the Bible is denigrated, then what is left for those proclaiming its truths or those hearing them? Jesus himself stated that “if a house is divided against itself, that house will not be able to stand” (Mark 3:25). If the authority of a denomination, a church, a pastor, or a layperson is not standing upon the authority of Scripture, then such a one is divided against itself. Suffice it to say, Spurgeon was justified in his concerns in the denigration of biblical authority within the Union. Yet, Spurgeon would hold another issue with the influx of liberal theology upon the Baptist Union, one that is the outflow of one’s dismissal of biblical authority—the lack of spiritual integrity. To Spurgeon, spiritual integrity was essential. Spurgeon writes that “When man confides in God, there is a point of union between them, and that union guarantees blessing. Faith saves us because it makes us cling to God, and so it brings us into connection with him.” Due to the emphasis on prayer and spiritual integrity, one would not be surprised when one discovers that Spurgeon’s complaints pertaining to the Baptist Union, surrounded, as McBeth denotes, “the decline of prayer meetings among Baptist churches, the worldliness of ministers…and doctrinal decay.” Some might claim that Spurgeon was intruding into affairs that did not concern him. However, such a one would not understand the emphasis that Spurgeon placed upon prayer. To Spurgeon, prayer and a strong relationship with Christ was essential for ministry. Peter J. Morden denotes that “The corporate prayer meeting, as well as being critical to his ministry, was a means of personally experiencing close communion with God. Such times were certainly vital to his prayer life; they were vital too, to his overall spirituality—the way he related to God.” Thus, for Spurgeon, if one did not possess a strong relationship with God, then one would become susceptible to heterodoxy and heresy. In contrast, if one were to remain faithful to God in their spiritual lives, then one would be kept safe in the confines of orthodox beliefs and practices. Spurgeon denoted that “if thou canst trust God in thy trial, thou wilt prove and enjoy the power of prayer. The man that has never needed to pray cannot tell whether there is anything in prayer or not.” Since liberal theology had invaded other areas, the lack of spiritual fervor resulting from such liberal tendencies added further reasons for Spurgeon to leave the Union. If one did not believe in the authority of the Scripture, then why would one desire to live by what the Scriptures claimed? For modern Christians, the spiritual decline among leadership must also be combated. Dave Earley denoted that recent surveys demonstrated that “only 16 percent of Protestant ministers across the country are very satisfied with their personal prayer life.” Like Spurgeon, the modern church needs to place a high value upon spiritual health—for the pastors and the laity alike. The natural progression of spiritual decline begins with humanistic soteriology and a low integral value for Scripture. It then progresses to decay one’s spiritual life with God before eroding one’s moral integrity. The forthcoming section of the paper will evaluate theological liberalism’s influence upon the moral integrity of the ministers of the Baptist Union in the late nineteenth century. Theological liberalism had brought forth moral depravity among those who were supposedly redeemed in the Baptist Union in the late 1800s. Spurgeon called one of the evils penetrating his time the “growth of wickedness in the land, especially in two forms, which we ought not to overlook. One is, the growing worldliness among professing Christians. They are indulging in extravagance in many ways; in luxurious habits, dress equipages, feastings, and so on, and wasting the substance of which they are stewards.” David Nelson Duke denoted that “Spurgeon’s social concern was grounded in his devotion to God in Christ.” For Spurgeon, living a sinful life was essentially rejecting the authority and even the existence of God. Spurgeon denoted that “There are some, whose lives have proved how sinful their nature was, for their sin has taken the form of open and gross vice…Opposition to divine sovereignty is essentially atheism. Men who have no objection to a god who is really no god; I mean, by this, a god who shall be the subject of their caprice, who shall be the lackey to their will, who shall be under their control.” According to Spurgeon, many among the Baptist Union, both clergy and laity, had engaged in immoral and rebellious acts which demonstrated a lack of commitment and a lack of belief in the sovereign God. The modern Christian should benefit greatly by Spurgeon’s example, standing against immorality in the Baptist Union. Immorality is the end result of liberal theology. If one does not hold to the authority of Scripture and does not place a high value of the grace of God, then one will be less inclined to maintain a strong spiritual walk with God. If one does not maintain a strong spiritual walk with God, then one will collapse into a worldly lifestyle. According to Spurgeon, such a collapse was transpiring in the Baptist Union in the late nineteenth century. Since Spurgeon had no backing by the leadership of the Baptist Union, the only recourse left for Spurgeon was to resign his association from the Baptist Union. This paper has evaluated the influence of theological liberalism upon the Baptist Union and in the decision of Charles Haddon Spurgeon and the Metropolitan Tabernacle leaving the Baptist Union. The paper has demonstrated that, according to Spurgeon, theological liberalism had led many ministers to minimize the influence of God in salvation, even leading many to Unitarian beliefs. In addition, the paper evaluated Spurgeon’s claims that theological liberalism had lessened the authority that many had placed upon Scripture. Due to these influences, theological liberalism was shown to influence the spiritual and moral lives of the clergy, ultimately influencing the laity, also. The downside to such a paper as this is that only one side of the equation is offered. For those who were accused of liberalism, those individuals may have claimed that Spurgeon was reaching beyond the boundaries, becoming greatly involved in the lives of others. Nonetheless, history tends to reveal the truth. While Spurgeon’s withdrawal did not hold a huge impact upon the Baptist Union at the time, eventually it would. The Baptist Union remained in steady decline throughout the twentieth century. Perhaps one of the greatest tragedies was the remarkable impact the controversy factored into the famed preacher’s health. While certain aspects of Spurgeon’s ministry are not accepted by this paper—perhaps mostly the disdain that Spurgeon held for apologetics seen so clearly in some of his messages; this paper commends Spurgeon for the convictions he held pertaining to the authority of Scripture, proper theology, and the impact that a relational walk holds in the life of the believer. Modern Christians would do well to share these convictions even if they do not agree with Spurgeon on all fronts. The previous paper represents the academic work of Brian Chilton. The work has been submitted and thus any attempt to plagiarize this work in future academic works will be noted by one’s academic institution. As always, be sure to offer proper citations for any work used in this piece. Duke, David Nelson. “Charles Haddon Spurgeon: Social Concern Exceeding an Individualistic, Self-help Ideology.” Baptist History and Heritage 22, 4 (October 1, 1987): 47-56. Accessed May 28, 2015. ATLA Religion Database with ATLASerials, EBSCOhost. Elwell, Walter A. Evangelical Dictionary of Biblical Theology, Baker Reference Library. Grand Rapids: Baker Book House, 1996. Estep, William Roscoe. “The Making of a Prophet: An Introduction to Charles Haddon Spurgeon.” Baptist History and Heritage 19, 4 (October 1, 1984): 3-15. Accessed May 28, 2015. ATLA Religion Database with ATLASerials, EBSCOhost. Ferguson, Duncan S. “The Bible and Protestant Orthodoxy : The Hermeneutics of Charles Spurgeon.” Journal of the Evangelical Theological Society 25, 4 (December 1, 1982): 455-466. Accessed May 28, 2015. ATLA Religion Database with ATLASerials, EBSCOhost. Geisler, Norman L. Chosen But Free: A Balanced View of God’s Sovereignty and Free Will. Minneapolis: Bethany House, 2010. Keathley, Kenneth. “The Work of God: Salvation.” A Theology for the Church. Edited by Daniel L. Akin. Nashville: B&H, 2014. McBeth, H. Leon. Baptist Heritage: Four Centuries of Baptist Witness. Nashville: B&H Academic, 1987. Morden, Peter J. “C. H. Spurgeon and Prayer.” Evangelical Quarterly 84, 5 (October 1, 2012): 323-344. Accessed May 28, 2015. ATLA Religion Database with ATLASerials, EBSCOhost. Piper, John. Charles Spurgeon: Preaching Through Adversity. Minneapolis: Desiring God, 2015. Pitts, John. “British and American Preaching Since 1900.” Baker’s Dictionary of Practical Theology. Edited by Ralph G. Turnbull. Grand Rapids: Baker, 1967. Skinner, Craig. “The Preaching of Charles Haddon Spurgeon.” Baptist History and Heritage 19, 4 (October 1, 1984): 16-26. Accessed May 28, 2015. ATLA Religion Database with ATLASerials, EBSCOhost. Spurgeon, Charles Haddon. All of Grace. n.g. : CountedFaithful.org, 2012. Kindle Electronic Edition. Spurgeon, Charles Haddon. “The Child of Light Walking in Darkness.” The Metropolitan Tabernacle Pulpit Sermons. Volume 33. London: Passmore & Alabaster, 1887. ______________________. “A Sermon for the Time Present.” The Metropolitan Tabernacle Pulpit Sermons. Volume 33. London: Passmore & Alabaster, 1887. ______________________. “General Yet Particular.” The Metropolitan Tabernacle Pulpit Sermons. Volume 10. London: Passmore & Alabaster, 1864. ______________________. “It Pleased God.” The Metropolitan Tabernacle Pulpit Sermons. Volume 56. London: Passmore & Alabaster, 1910. ______________________. An All-Round Ministry. Edinburgh, UK; Carlisle, PA: The Banner of Truth Trust, 2003. ______________________. The Downgrade Controversy. Charleston, SC: BiblioBazaar, 2008. John Piper, Charles Spurgeon: Preaching Through Adversity (Minneapolis: Desiring God, 2015), 1. John Pitts, “British and American Preaching Since 1900,” Baker’s Dictionary of Practical Theology, Ralph G. Turnbull, ed (Grand Rapids: Baker Book House, 1967), 14. Kenneth Keathley, “The Work of God: Salvation,” A Theology for the Church, Daniel L. Akin, ed (Nashville: B&H, 2014), 543. Norman L. Geisler, Chosen But Free: A Balanced View of God’s Sovereignty and Free Will (Minneapolis: Bethany House, 2010), 19. William Roscoe Estep, “The Making of a Prophet: An Introduction to Charles Haddon Spurgeon,” Baptist History and Heritage 19, 4 (October 1, 1984): 6, retrieved May 28, 2015. Duncan S. Ferguson,”The Bible and Protestant Orthodoxy: The Hermeneutics of Charles Spurgeon,” Journal of the Evangelical Theological Society 25, 4 (December 1, 1982): 455, retrieved May 28, 2015. Craig Skinner, “The Preaching of Charles Haddon Spurgeon,” Baptist History and Heritage 19, 4 (October 1, 1984): 22, retrieved May 28, 2015. The realm of God’s knowledge of future contingents resembles that of modern Open Theism. Alan Cairns, Dictionary of Theological Terms (Belfast; Greenville, SC: Ambassador Emerald International, 2002), 420–421. C. H. Spurgeon, “General Yet Particular,” The Metropolitan Tabernacle Pulpit Sermons, Volume 10 (London: Passmore & Alabaster, 1864), 238. C. H. Spurgeon, “Progressive Theology,” Sword and Trowel (April 1888), in C. H. Spurgeon, Down-grade Controversy (Charleston, SC: BiblioBazaar, 2008), 88. C. H. Spurgeon, “Notes,” Sword and Trowel (1891), in Charles H. Spurgeon, The Down-grade Controversy (Charleston, SC: BiblioBazaar, 2008), 148. Walter A. Elwell, Evangelical Dictionary of Biblical Theology, Baker Reference Library (Grand Rapids: Baker Book House, 1996), 154. Two examples of this are found in the demythologization of the Bible presented by Rudolf Bultmann and the ideas of Paul Tillich. Ferguson, “The Bible and Protestant Orthodoxy,” Journal of the Evangelical Theological Society, 458-459. C. H. Spurgeon, “Another Word Concerning the Down-grade,” Sword and Trowel (August 1887), in The Down-Grade Controversy (Charleston, SC: BiblioBazaar, 2008), 36. C. H. Spurgeon, “The Child of Light Walking in Darkness,” The Metropolitan Tabernacle Pulpit Sermons, Volume 33 (London: Passmore & Alabaster, 1887), 557. C. H. Spurgeon, All of Grace (n.g. : CountedFaithful.org, 2012), Kindle Electronic Edition, 591. C. H. Spurgeon, The “Down-Grade Controversy: Collected Materials Which Reveal the Viewpoint of the Late Charles Haddon Spurgeon (Pasadena, TX: Pilgrim Publishing, n.d.), 513-514, in H. Leon McBeth, The Baptist Heritage: Four Centuries of Baptist Witness (Nashville: B&H Academic, 1987), 303. Peter J. Morden, “C. 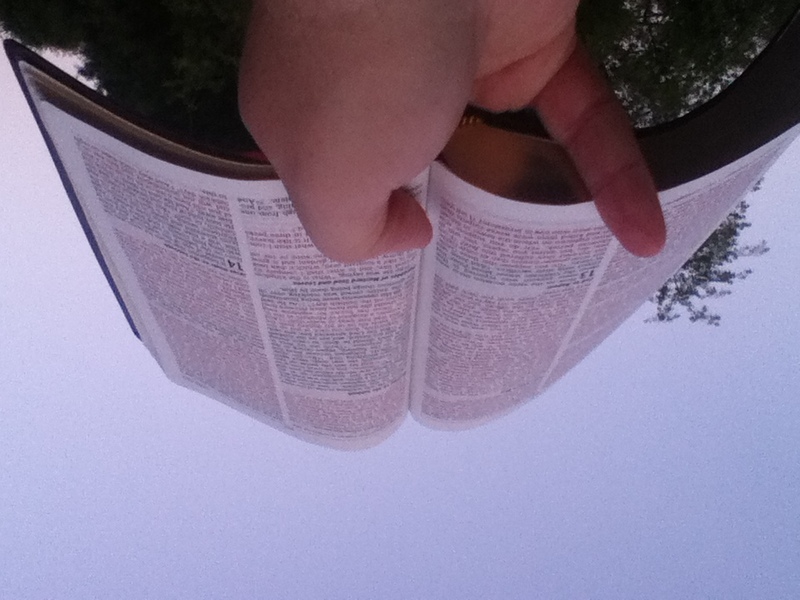 H. Spurgeon and Prayer,” Evangelical Quarterly 84, 5 (October 1, 2012): 325, retrieved May 28, 2015. Spurgeon, “The Child of Night Walking in Darkness,” The Metropolitan Tabernacle, 550. Dave Earley, Prayer: The Timeless Secret of High-Impact Leaders (Chattanooga, TN: Living Ink Books, 2008), 1. C. H. Spurgeon, An All-Round Ministry (Edinburgh, UK; Carlisle, PA: The Banner of Truth Trust, 2003), 102. David Nelson Duke, “Charles Haddon Spurgeon: Social Concern Exceeding an Individualistic, Self-help Ideology,” Baptist History and Heritage 22, 4 (October 1, 1987): 47, retrieved May 28, 2015. C. H. Spurgeon, “It Pleased God,” The Metropolitan Tabernacle Pulpit Sermons, Volume 56 (London: Passmore & Alabaster, 1910), 292-293. The Bible can be made to say what the interpreter desires for it to say. For instance, a person could rightly state that the Bible says that there is no God. For instance, Psalm 14:1 states quite explicitly “there is no God.” However, when placed in its proper context, one will find that David writes, “The fool has said in his heart, ‘There is no God'” (Psalm 14:1). It is disturbing how the Bible has been used to justify one’s preconceived opinions. At times, the Bible has been used to justify cultural ideologies. For instance, southern American plantation owners during the pre-Civil War days used the Bible to justify slavery. Civil rights leaders of the 1960s used the same Bible to condemn slavery and promote equality. Who was right? More importantly, is there a way that one can know what the Bible actually says instead of what one desires for it to say? The atheist misuses Scripture as well as the ultra-fundamentalist. Again, is there a way to know what the Bible actually says? “the science of the methods of *exegesis (q.v.). Whereas exegesis is usually the act of explaining a text, often in the case of sacred literature according to formally prescribed rules, hermeneutics is the science (or art) by which exegetical procedures are devised. In theology, hermeneutical theory arises out of awareness of the ambiguity of a sacred text and the consequent analysis of the act of understanding” (Cross and Livingstone 2005, 765). A difference exists between exegesis and eisegesis. Exegesis means that one allows the text to speak for itself whereas eisegesis indicates that one makes the text say what they want it to say. Individuals who desire to know the actual truth of the Scripture will practice exegetical practices. In this article, seven exegetical practices will be given that this writer has learned over the course of 13+ years of ministry. 1. Read the Bible in chunks instead of bits. Greg Koukl has said on his radio show “Stand to Reason” that one should never read a Bible verse. One should always read Bible passages. This is a great piece of advice. In fact, many misapplications of Scripture have taken place when one uses only one verse of Scripture. If a Bible verse does not make sense to the reader, the reader should read the paragraph. If the paragraph does not make sense to the readers, read the paragraphs before and after the verse in question. 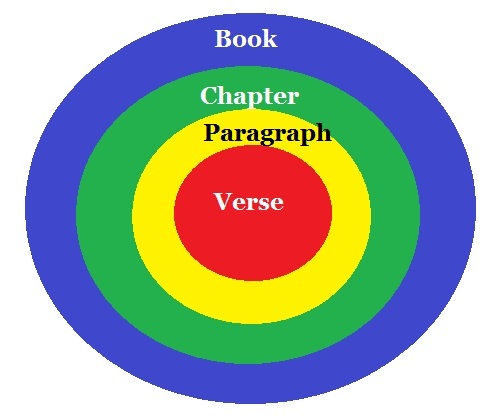 If the text still does not make sense to the reader, then read the chapter. If it still doesn’t make sense, read the surrounding chapters. If the text still doesn’t make sense, read the book. In other words, the reader will want to scan outwards. Consider the graphic below. Start with the verse and work your way outward. 2. Seek the writer’s meaning. Another important exegetical tactic is for the reader to seek the writer’s meaning. Before one extracts application from a text, one needs to first examine what the writer was trying to say to his intended audience. For instance: if one is examining Paul’s statement to the Corinthians where he writes that “women are to keep silent in the churches” (1 Corinthians 14:34), ask yourself what may have prompted such a statement from the writer. Was this universal in scope or was this directed towards a particular group of individuals? If applicable, seek out what the writer may have said in other such instances. For instance (concerning the controversial text above); note that Paul also in the same book recognizes women who pray and prophesy (1 Corinthians 11:5). When one is investigating any such passage of controversy, one needs to keep in mind who it is that wrote the passage and to whom it was that would be originally reading the text. 3. For controversial problems, investigate both sides of the equation. It is also important when investigating controversial passages to seek counsel from both sides of the theological aisle. For instance, a Calvinist should not limit herself to only the writings of John Calvin. She should also investigate what John Wesley had to say on this issue. Or, if a complementarian is investigating the role of women in the church, he should not only read the works of Wayne Grudem or John Piper. He should also read the works of Gordon Fee or Stanley Grenz. This will provide the exegete understanding about how those of differing views examine the text at hand. Note: this writer has been greatly challenged by Romans 9. I have found great value through the works of John Calvin and John Wesley. Most notably, I have actually gravitated towards a Congruist understanding of divine sovereignty and human freedom by the works of Millard J. Erickson, Norman Geisler, and Thomas Aquinas. 4. Go back to the original words. Understand that there is no perfect translation. The New International Version, New American Standard Bible, New Living Translation, and the great King James Version are imperfect translations. No translation is perfect. All translations include some decision-making on the part of the translator. For this reason, the expositor should learn to do word studies. One does not need to be a master of Greek and Hebrew to do word studies. A simple package from Logos software will allow one to do a good deal of investigation into the original words of Scripture. If Logos is not an option, buy a good interlinear. An interlinear is a Greek New Testament with the English equivalent underneath. A Strong’s Concordance or Mounce’s Complete Dictionary of Old and New Testament Words will do the expositor a world of good. Don’t be afraid to do some historical research. Face the facts: the Bible is 2,000 years removed from the expositor’s timeframe. Jesus did not live in modern America. He was not of pasty white complexion nor was He of an anemic build. Jesus worked with His hands and most likely had to do some mountain-climbing in order to get across some of the areas in which He traveled. Jesus participated in the culture of the day. This means that He drank wine (Matthew 11:19) and that He participated in Hanukkah (John 10:22). Does this indicate that the Christian should participate in either of these? Do your research to find out. Nonetheless, the expositor will need to investigate the historical context of the Scripture to understand its intended meaning. 6. 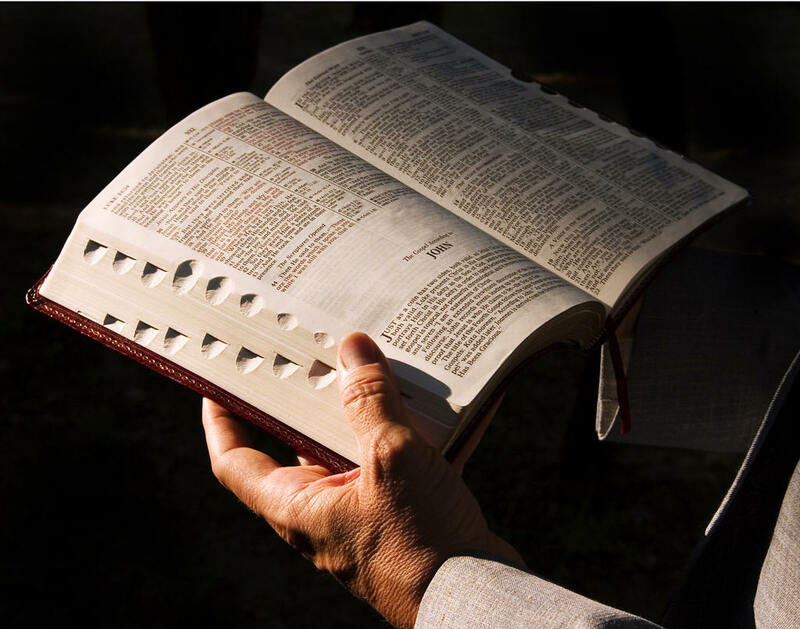 Learn that the best commentary on the Bible is…the Bible. The best commentary of the Bible is the Bible. This means that the Bible provides answers to controversial passages when one investigates the entire message of the Bible. For example: one must keep a balanced view when dealing with the nature of God. One cannot forget that God is love (1 John 4:8), but one cannot forget that God is holy, too (Revelation 4:8). Therefore, one must learn to cross-reference when studying Scripture. A topical Bible or Thompson’s Chain Reference Bible may prove to be invaluable resources for the expositor. 7. Read a variety of translations. As noted earlier, there is no such thing as a perfect translation. Translation is an interpretive process. With that in mind, it should be noted that one should read a variety of translations. Some translations come with the approval of a particular denomination. The King James Version (or Authorized Version) is an Anglican translation while the Holman Christian Standard Bible is a Southern Baptist translation. Some translations hold a more liberal slant (some would argue that such is the case with the Common English Bible and the New Revised Standard Bible). While some translations hold a more conservative slant (e.g. English Standard Version). It is important to use a wide variety of translations when one studies the Word of God. If one examines the articles on this website, one will probably note that a variety of translations are used for different articles. The New American Standard Bible is used for this particular article. 8. Be willing to admit when the Bible leads away from your preconceived notions. Finally, and this is most important, to be a good expositor of the Bible, one must note the biases that the reader may hold. In such a case, when one’s worldview is contrasted with the teachings of the Word of God, accept the Scripture’s teaching over your preconceived notions. Be willing to admit that you might be wrong in how you view certain things. Holding such humility will allow God to mold the expositor by the Word instead of molding the Word into one’s ideology. Remember that “All Scripture is inspired by God and profitable for teaching, for reproof, for correction, for training in righteousness; so that the man of God may be adequate, equipped for every good work” (2 Timothy 3:16-17). Also remember the classic words from Isaiah 55:8 where God says, “‘For My thoughts are not your thoughts, nor are your ways My ways,’ declares the Lord” (Isaiah 55:8). If God’s ways differ from the expositor’s, God’s ways should be chosen to be followed. Hermeneutics is not always an easy process. But as the old adage goes, “Anything worth doing is worth doing right.” This is especially true when it comes to biblical interpretation. For the pastor or Sunday school teacher, there is an even greater responsibility to get the truths of God right. For as Jesus said, “From everyone who has been given much, much will be required; and to whom they entrusted much, of him they will ask all the more” (Luke 12:48). This is a responsibility that this pastor takes very seriously. While none of us will agree on every minute detail, we can and should agree on the core essential truths found in God’s Word. For I had rather be despised by humanity and loved by God for proclaiming truth, than to be despised by God and loved by humanity for promoting lies. All Scripture, unless otherwise noted, comes from the New American Standard Bible. La Habra: Lockman Foundation, 1995. Cross, F. L., and Elizabeth A. Livingstone. The Oxford Dictionary of the Christian Church. Oxford; New York: Oxford University Press, 2005.